Next to the former railway station of Giverny-Limetz now converted into a ‘salle des fetes’ (community hall), the big fir tree proudly sports Christmas light garlands. In winter, simplicity and peacefulness reign in the little village of Claude Monet, inhabited by 500 persons only. 631 000 visitors flocked to the water lily pond in 2015, from late March to early November. Now that they have gone, it is like night after day, a time for relaxing and dreaming. 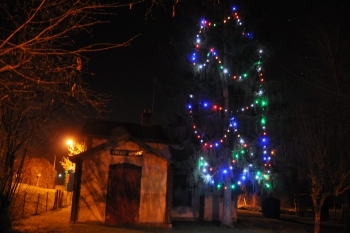 The Christmas tree shines for the Givernois (inhabitants of Giverny) and for the passersby driving on the Chemin du Roy. 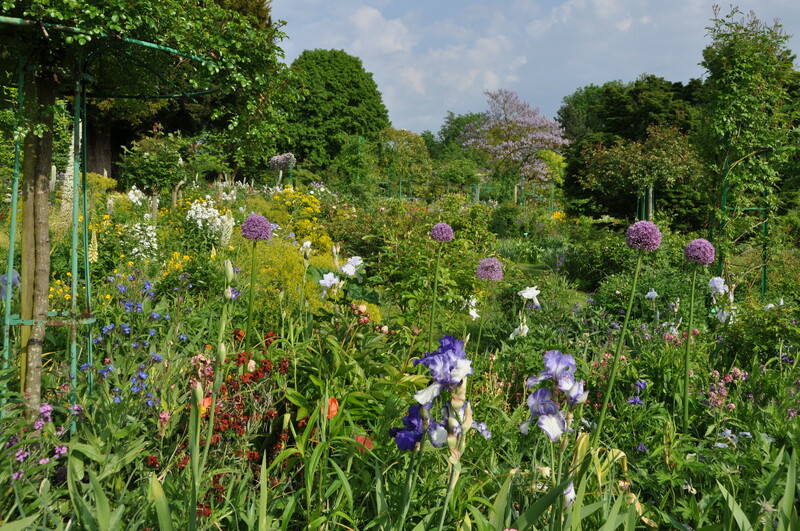 Giverny was very peaceful but not totally desert this afternoon, due to a reasonably sunny Sunday. The shutters on Monet’s house are locked for the winter. Although it is not possible to enter any museum or garden, although cafés, restaurants and gift shops are closed, the village itself seems to attract people looking for a nice stroll. 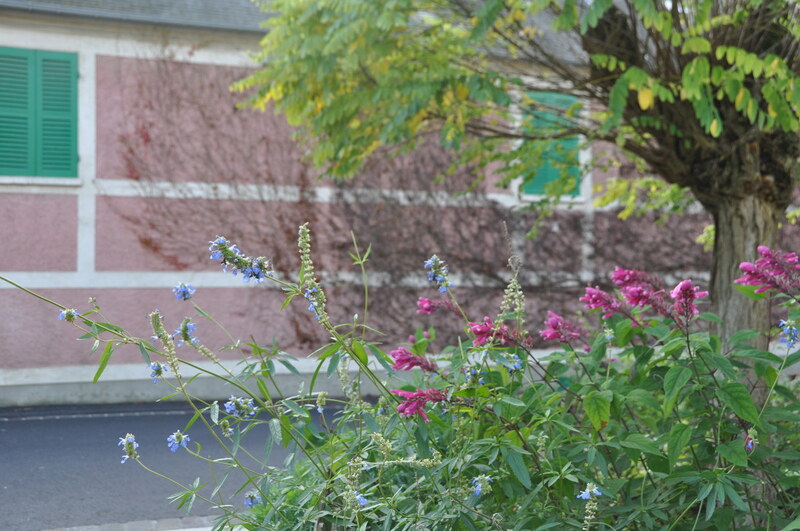 Along the streets the flower beds continue to provide some flowers like sages, fuchsias, roses and dahlias. 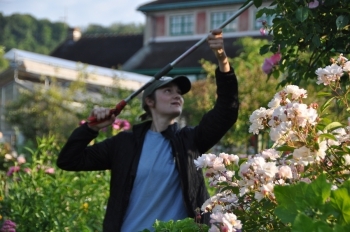 They will resist until frost, or until the gardeners decide to pull them out. One day, in the next months, they will be changed for spring flowers. 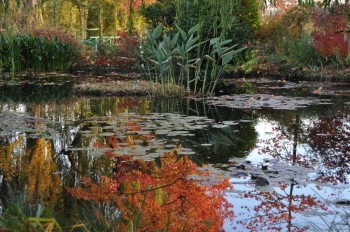 Monet’s gardens are closed for the winter since this morning. In the water garden, the show goes on for nobody except for the black birds and finches, still singing occasionally in the branches. I wonder if the carps in the pond can see the gorgeous colors of the sweet gums over them. Reopening of Giverny on March 26th, 2016 with a brand new spring garden in pale pinks and fresh greens. 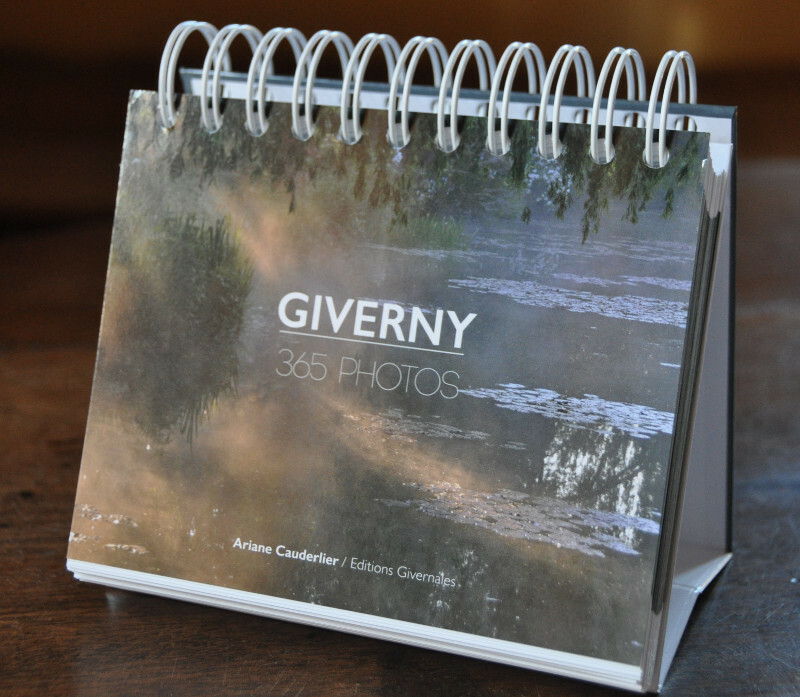 Here is my new perpetual calendar featuring Monet’s house and gardens at Giverny. 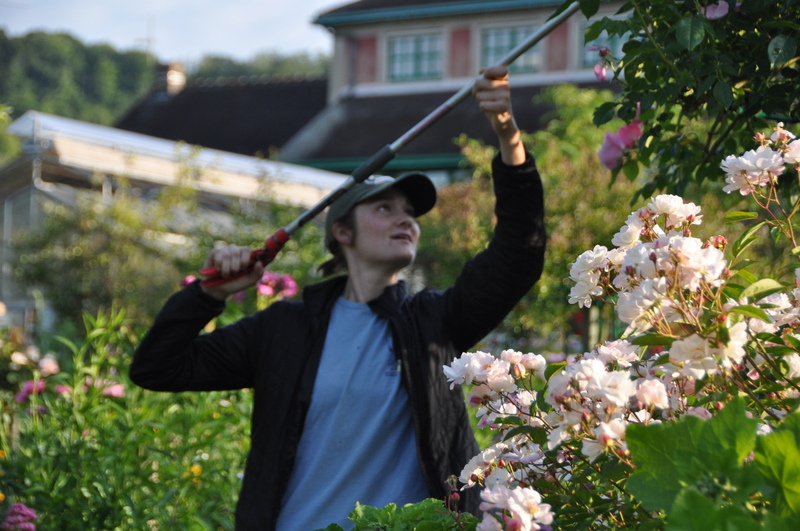 I have carefully selected my best photos among thousands of pictures I’ve taken over the past years in the famous painter’s gardens. The shots follow the seasons. 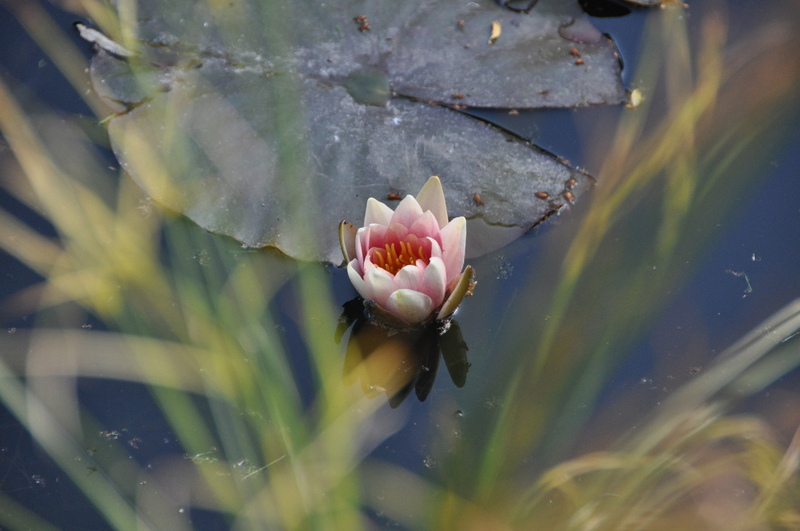 Page after page, day after day, you see how spring arrives and settles, gets to its glory, turns into summer and its plenty, until autumn comes with more flowers than ever and fabulous colors reflecting into the pond. Winter has unexpected delights to offer, for instance the garden covered with snow, the frozen pond, or gorgeous sunrises over the Seine. 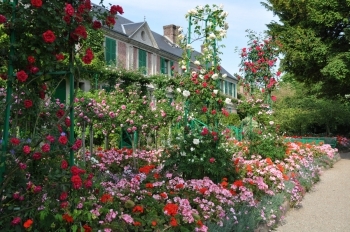 To make sure the new picture is a new surprise every day, landscape views alternate with flowers close ups, streets of Giverny with details of the house decoration, and more. Each picture has a caption in English and in French. The calendar has been designed and printed in France by a nature-friendly manufacturer. The size is 15×12 cm, (4.7′ x 5.9′) including a white stripe at the bottom for your notes. The price is 19 euros. I am happy to ship worlwide for an extra cost of 3.5 euros. For instance, total cost for the United States is 25 US$, or 17 £ for Great Britain, or 34 CAD, shipment included. At Giverny in Rue Claude Monet, one of the mail boxes to send letters and postcards is located amid flowers. 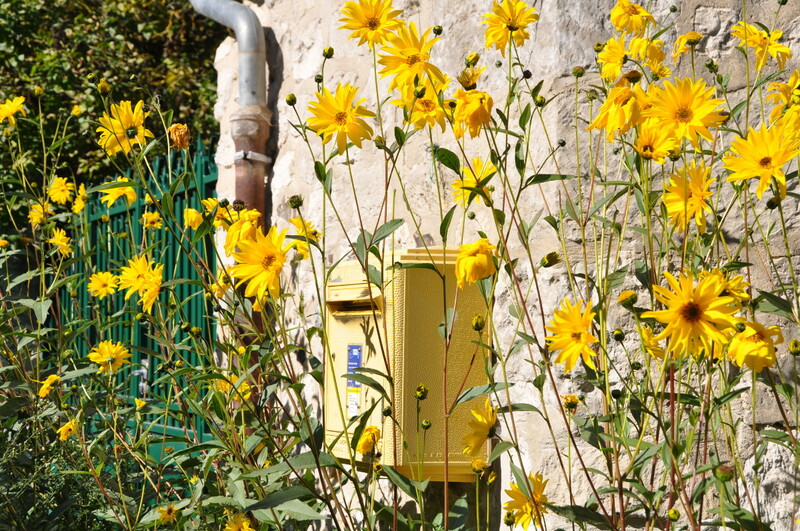 In October, the helianthus are big enough to reach the height of the mail box. Their yellow hues match the official color of La Poste boxes. 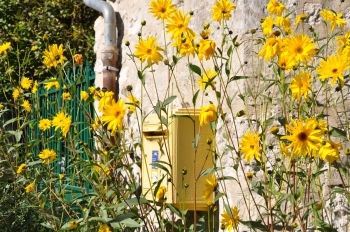 Having to make your way through the flowers to post your mail makes paying the bills just a little more fun. 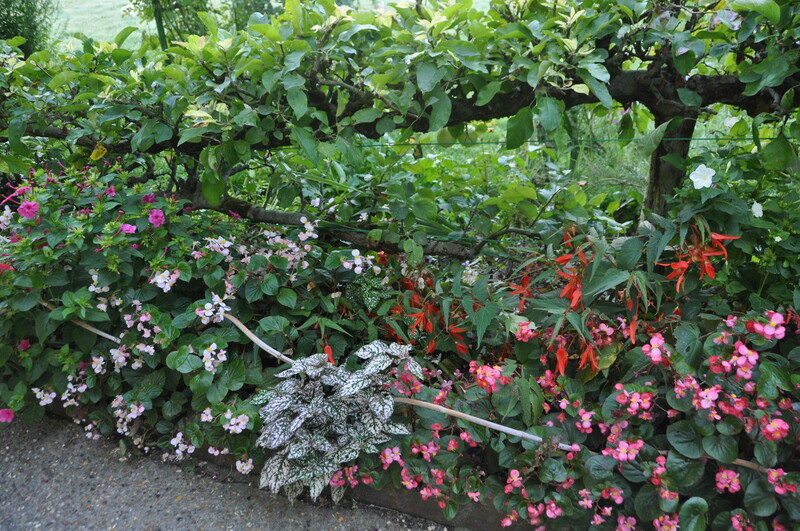 In Monet’s flower garden at Giverny, a beautiful border covers the feet of the espaliered apple trees. These colorful cushions are made of begonias boliviensis, whose lovely leaves resemble angel wings, combined with pink begonias semperflorens, four o’clock plants and polka dot plants. The latter is often used in planters but it is also a very nice ground cover, that brings color and doesn’t need deadheading. According to a keen gardener I met, polka plants are ‘the best thing since sliced bread’. It was the first time I ever heard this funny expression that doesn’t translate into French. Well, you can translate word for word, but it is not a colloquialism and I can’t think of any equivalent. This is great with foreign languages: you keep learning as long as you talk with native speakers, and sometimes you remember how it felt when you were six and wouldn’t understand exactly what people meant. 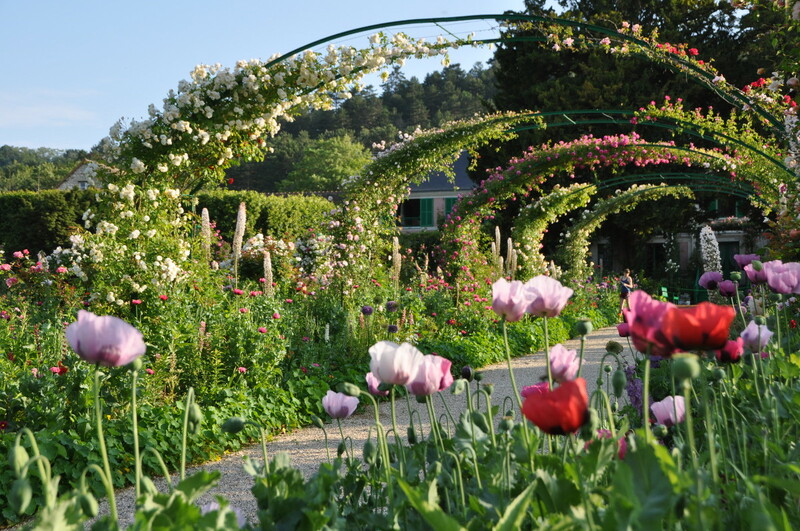 And this is what I find so great with my job: sharing with avid gardeners, speaking foreign languages, meeting wonderful people, and walking daily in the little Eden designed by Monet. 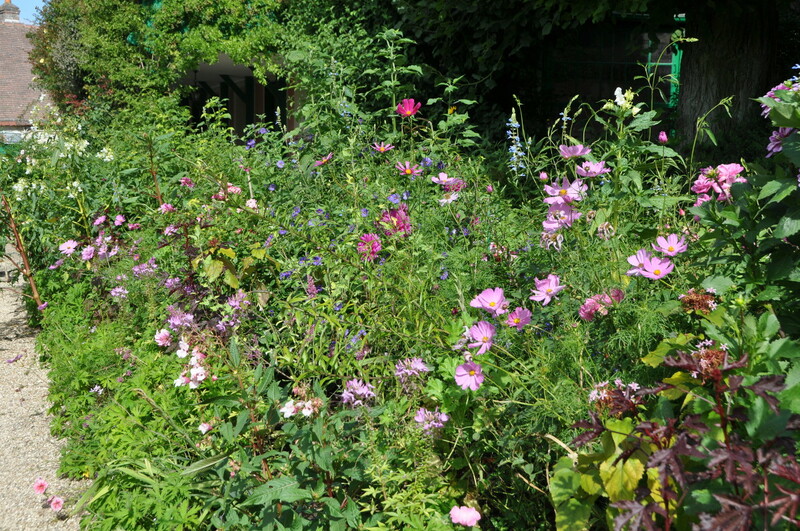 All this combines like the flowers in the flower bed and makes my life happy and colorful. Thank you to you all. For a French tongue, pronouncing the English words starting with an h is not that easy. The French language doesn’t have this sound, thence it is a special effort to say these words right. I do my utmost. I apply myself. I concentrate. I don’t mix up edges and hedges, ear and hear. Today however, at the end of my tour in Monet’s garden, a gentleman came to me. He told me that there is a word that comes several times in my commentary that I didn’t say right: heir. Monet’s heir, his son Michel. As a lawyer, he explained, it is a word he knows only too well. It is not like the hair, but like the air. Wow. Isn’t it disconcerting? I expected exactly the contrary, that I had forgotten the h. I was very grateful, because it was done with kindness. It felt like receiving a little gift. My English has improved a lot since school, thanks to the native speakers I meet every day. But very few take the trouble to correct me. I suppose a certain quantity of mistakes is acceptable, just like for you when reading this blog. I’ve improved because I paid attention to the right phrases, grammar, or pronunciation of my interlocutors. But I never realized this very mistake, although lots of visitors have asked me about Monet’s heirs. Because it is not relevant in French, I didn’t notice that the h was missing. 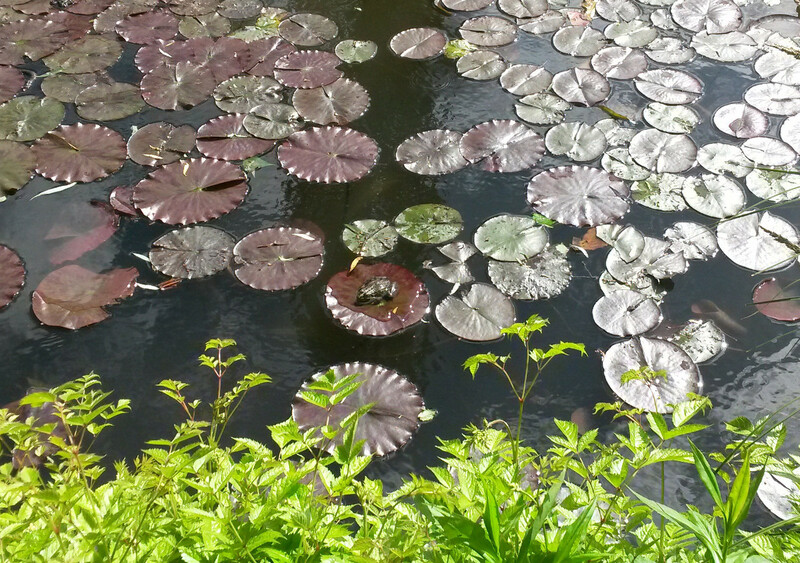 When there is no wind at all, the water lilies painted by Monet at Giverny seem to be floating in the air. The surface of the pond is such a perfect mirror that the water turns invisible. The rafts of water lilies resemble flying carpets en route for a long trip to mysterious countries. 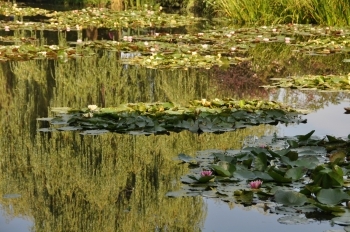 Claude Monet was never tired of painting his water lilies, because they are ever changing. They open, they close, they float on a mirror that reflects the clouds passing, the sun getting higher and lower in the sky. 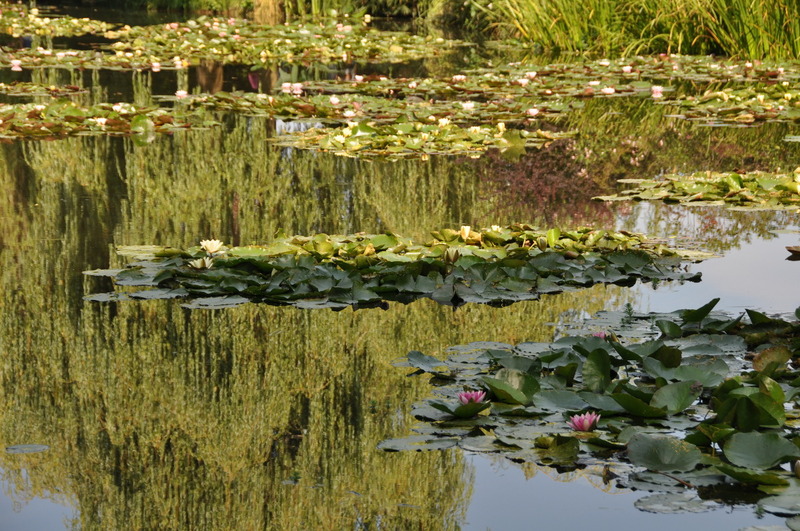 Monet painted his water lilies relentlessly, almost 300 times. It is a question that visitors I guide through the gardens ask regularly: “Do you ever get tired of it?” No, never. How could one get tired of beauty? 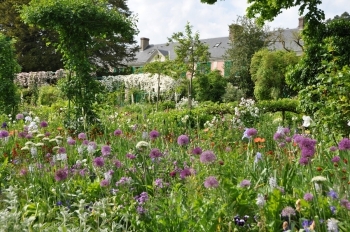 In May, a big tree crowns Monet’s flower garden with a beautiful mauve blossom. It is a paulownia, also named princess tree or impress tree. Its color harmonizes with the purples of the alliums in the Norman Enclosure. They combine with the yellows of isatis, their complementary color, for more vibrance. There is even a more subtle combination. The paulownia is so big that it can be seen from the water garden. 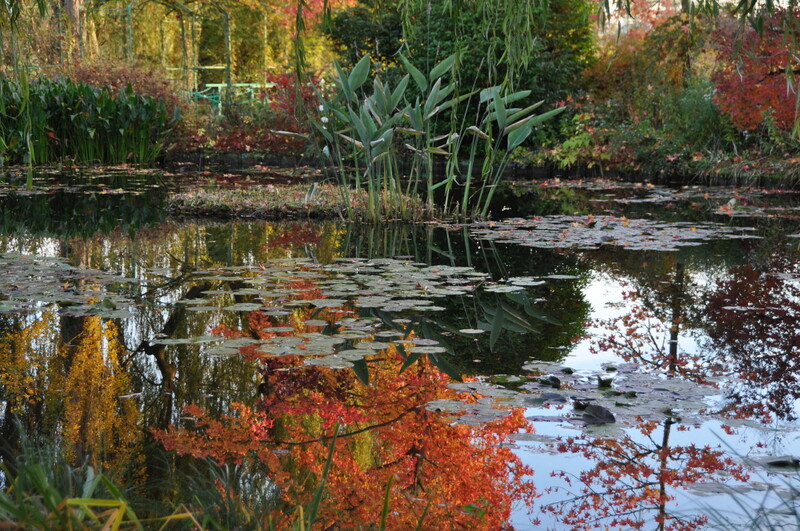 It reflects into the pond between the reflections of the wisterias on both sides of the pond. They have exactly the same color and flower the same two weeks, as if they would have organized their annual meeting. 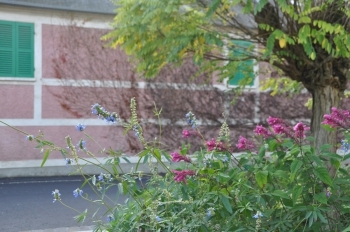 Thus they create a connection between the two gardens separate by the road. The first Nympheas have opened! 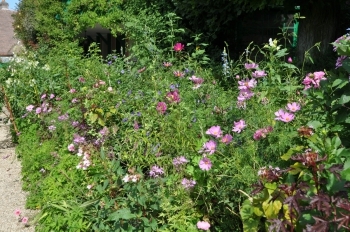 They will flower until September. I’m grateful to the kind visitor that quoted the above title, and then patiently explained to me the related colloquialism and thus the joke. In French we don’t have the same image. We say that time passes in a lightning, le temps passe en un éclair. The way each language expresses reality and experiences its own way is an endless source of amazement and amusement to me.